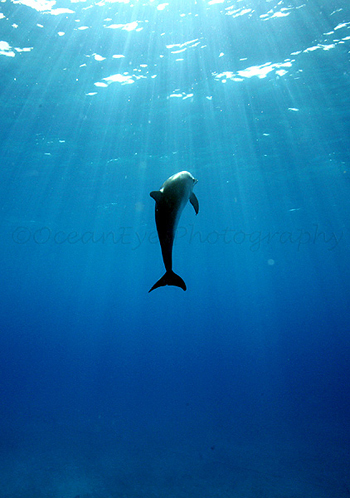 When I began swimming among the Hawaiian dolphins in 1988, my first year was an experience of getting to know them and their civilization in the oceans of Earth. Then as time went on and I became completely at home in the water, diving deeply with them and recognizing their sounds, I began to understand their "language." 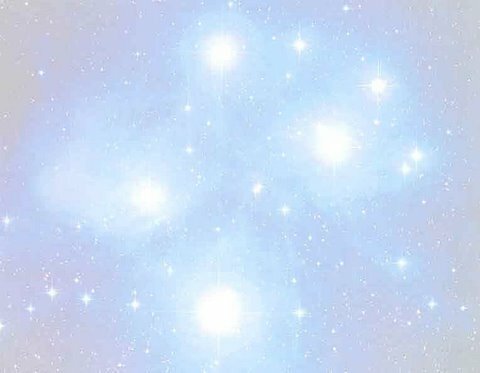 They were communicating to me and I began to emotionally connect with their tonal and vibrational language. As the messages came in, I knew I was meant to share their story with the world. It was a great pleasure for me to relate and record their history and their knowledge of this planet. In my first two published Dolphin Connection books, I shared many of the experiences and the messages I received. There was one message that I was reluctant to put in my second book, but the dolphins strongly requested that I include it. With trepidation because I felt the outrageousness of the message would cause my entire body of research with the dolphins to be discredited, I nevertheless, followed their wishes and included their explanation of how and why and when they entered the Earth's time line. It is a fascinating Time Travel story. On page 161 of the book Dolphins into the Future(1997), you can read the surprising explanation of how the dolphins arrived on Earth. They said they came through A Window in Time. Most people, reading the book could not understand that chapter. They skipped over it and went on to other more easily understood concepts. Over and over again in seminars and speeches I would be questioned about the meaning of that passage. After all, everyone knew the history of dolphins. 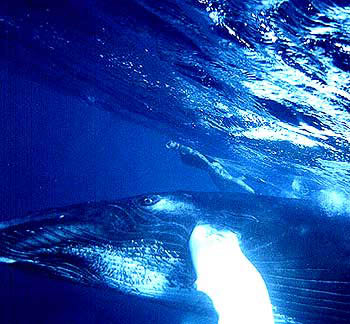 They had lived here for millions of years, they had even begun as land mammals who then evolved into the water. This was and still is the common belief regarding dolphin evolution. But the dolphins told me they had arrived around the 1940's; only 80 years ago. How could that be? We had all read the thousands of stories about their history among the Greeks and Romans, the myths and legends, the drawings, Petra glyphs, carvings, artifacts, fossils and more. These were ancient legends of their love for humanity and the love of the gods for them. Every child learned about it in their classrooms at school. But NO, the dolphins told me they entered Earth's time line through a Window in Time. Carefully, very carefully, they chose the perfect place along our horizontal time line and they entered in to help us. They created a vertical intervention, perfectly intercepting our space-time field.
. The many stories we have come to know and love, BUT the history was one that they structured to fit into our world of evolution and science. To fit into the life patterns and cultural beliefs of earth people and be accepted. 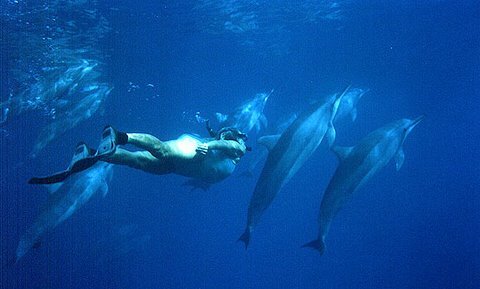 And accepted the dolphins were, as many key people unaware that they were participating in a reality over-lay responded to feelings of affinity for dolphins by creating dolphin television programs-such as Flipper, conducting research into dolphin brain physiology and neurology, writing books and building captive pools to entertain and educate the public and bring the joy of the dolphins into human awareness. 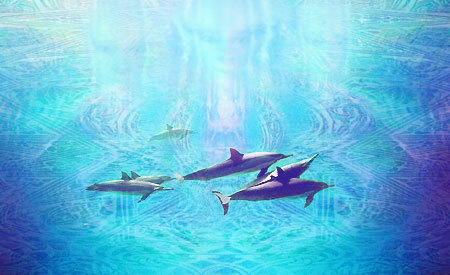 The dolphins, as multi-dimensional entities, foresaw these events and chose to go ahead with the intervention in an attempt to raise awareness. 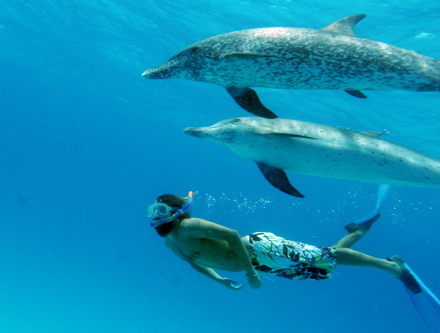 The dolphins came as teachers, although they wouldn't call themselves that. As we watched them and learned about their altruistic behaviors we learned about their society living in the ocean, which exemplified a life style that was kind, cooperative and healthy. We learned about freedom and living simply in a carefree setting. 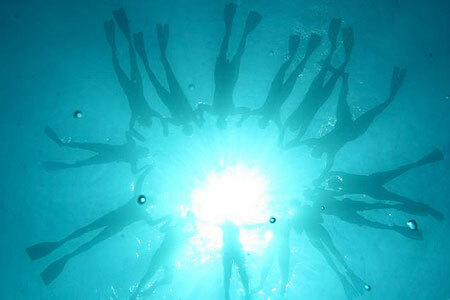 That lifestyle called to us and made us want to learn more from the dolphins, to get to know them better. Only two decades ago this idea of a vertical intervention on the part of the dolphins seemed quite radical. But now in the 2000s we learn about the experiments with Time-Space journeys and interventions, which are part of the history of mankind. Now I know why the dolphins strongly recommended I write and talk about these concepts. 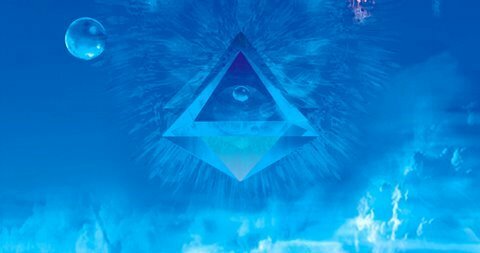 As always, they are here to help us to open our minds to the larger world around us, to pay attention to the shrinking of our freedoms and help us move beyond the old programmed paradigms that began to limit us and still inhibit us now. In 2003, I offered a Portal Seminar in my home in Hawaii that dealt with these skills. Forty-four people were in attendance and we were to join together with the dolphin pods to form a Window in Time, enter the time line of the Earth on August 12th, and pour volumes of Love onto Earth. Not with the use of technology but with the feelings of love and compassion in our hearts. We succeeded in doing this. It assisted the Earth's inhabitants to move into a frequency of Higher Consciousness and elevated awareness. This is the positive use of group compassion during peak energy cycles on Earth. In 2009 it was time to bring more information forward to people. 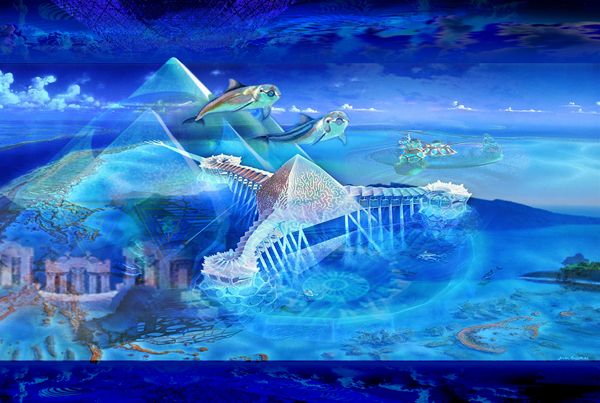 It was coming from the dolphins, whales and certain benevolent Star civilizations. They guided me to look again (because now the timing was right) at the Philadelphia Experiment and the subsequent scientific studies of time travel following it. Here I learned that the scientists at Montauk Point went far beyond the experiments that had leaked little by little to the investigative scholars of today. They had developed expertise in Time Travel that also allowed for changing events in the past that would affect the present and the future. This they did. For example, they were able to fund their expensive research by unethically sending their many research subjects into the past, where they were able to purchase real estate and buildings there and then, holding title, sell them in the present and the future at a 500% profit. Many of these valuable pieces of real estate were stolen from the original owners. The technicians knew what prestigious areas would be high income turn-overs based on the realities of the present real estate market. They purchased and sold at great advantage. This money partially funded the Black Projects. In addition they located the lost Nazi gold that is, to this day unaccounted for. They were able to go into the past and learn where the gold was hidden. According to our present history books, the Nazi gold seemed to disappear. In fact, the scientists using Time Travel, visited the past, related the where abouts of the hidden gold, men were dispatched to steal it and then it was sold providing funds for covert projects. They visited the Civil War (1861-1865), and found that the South had won the war, not the North. Our modern scientists in the 1980s decided to change that war. And just like the dolphins' Window of Time, the entire memory of the human race, the history books and historians were instantly converted to the memory and history of the War Between the States as having a northern victory instead. That is the memory we retain, today. Yet if you read the true history and diaries of that era, you will see that the South was the stronger army with many more battles won than the North. During one long experimental stage, the scientists entered a parallel reality and examined a world in which Adolph Hitler and the Nazis won the war. With many legions of dedicated German scientists, it was found that the Nazis had developed a bomber that could fly to America (this at a time when American aerial vehicles were still prop type planes.) Hitler had invented a long range bomber that could travel to America. The Third Reich had also developed the atomic bomb and the delivery system for it as well. Using Time Travel techniques, the American military were able to learn of this bomber and to go into the past to the time when it was being designed to locate and destroy it. They shot it down and it was never rebuilt. Germany at that time was the leader in atomic bomb technology and they had jet planes. In the case of World War II (1939-1945), Germany had actually lost the war but the scientific experiments at Montauk examined the parallel world in which Hitler won the war. After looking at the ramifications of that Nazi take over of the world, they returned to our current time line to reinstate the reality in which the Allied troops are the victors. They intervened and invented, earlier in the time line, the technology known as night scopes and other useful war machines to expedite the success of that Allied victory. Another program examined the John F. Kennedy assassination. They examined a past where the President was not killed. In that reality, the Vietnam War ended as President Kennedy had promised. Moving forward a little in time, Kennedy was not re-elected, but a change in attitude occurred among the American public where there was a greater faith in government and a belief that the Administration cared about the well-being of the American people. But as the Time-Space scientists continued to look at that unfolding scenario, they experienced the Kennedy era at the time of the Cold War. The U.S. was spending so much money fighting the Cold War, that it drove the U.S. into the ground financially. It was out of control, competing, spending, when actually the Russians didn't have that many nuclear weapons as was thought. In the reality where Kennedy did not die, the U.S. tumbled into a recession in the 1980s (just like the Soviets experienced in our present time line), and then into a devastating depression. The secret cabal did not want that scenario to unfold, with the subsequent loss of their money, and so it was decided to leave the history as we know it now, and that Kennedy must die. The reason that time line was not rearranged to change history and spare the President was because the Illuminati did not want the war to end. The Vietnam War was a front to maintain the Opium fields in Vietnam. It was bringing in millions of dollars that helped to fund the experiments in Time Travel and other black budget programs. The secrecy around this illegal drug business was so all encompassing that there were occasions when soldiers were court marshaled because following their commanders orders to clear an area, they complied with the normal procedure of burning down entire towns and fields. Some of these fields were Opium growing acreage and the innocent soldiers were penalized for their error. The current attitudes (in the 2000s) of questioning and doubting governments and elected and military officials grew out of the horror and unanswered questions concerning Kennedy's death. It was fully utilized when the Illuminati wanted to take President Clinton out of office. An entire smear campaign of releasing White House secrets and publicizing gossip about the President was devised on a massive scale. Before this time, respect for the office of the President and for the country would not allow it. Most of the presidents had elicit affairs while in office. But so long as it was not affecting their work, it would be considered a treasonous act to spread rumors to humiliate or bring down the president. It was an intolerable, unethical thing to do. And if the negative rumors persisted, they would be ignored. In Clinton's case, it was a conspiracy group that intentionally fanned the fire. This then set the precedence of digging up 'dirt' about people in office and using the media to emotionalize the rumors. The manipulated population would then succumb to the news reports of misconduct, catapulting into uncertainty, doubt, anger and discord. These ongoing experiments at Area 51, Montauk Laboratories, Los Alamos and Dulce, N.M. were dangerously increased. The researchers made many mistakes and untold numbers of people died in the experiments. Many of the subjects were sent off into another Time Space and could not be brought back. Where they went and how they fared was an unknown. They also learned that they could not play with these dimensions too often. If you make too many changes in a timeline, at the same place, experimenting with different realities, it fractures the timeline and damages it irreparably. It creates holes. Sensitive Time Travelers could feel when it was about to happen and they knew to get out of there fast. The frequency field became unstable. Eventually the scientists working on these projects developed a process of Time -Space continuums that no longer required the energies and vibrational fields of reluctant psychics hooked up with metal head pieces and electrodes. They were able to (in some way) record the precise vibrational frequencies required for effective time manipulation. Then they could use the recorded (digitized?) frequencies to perform the time travel with subjects at any time without needing a physical body to ground the experience. Many of these advanced procedures were possible due to the technology and assistance of the aliens. These Extraterrestrial technologies were not intended to be used to victimize people. Why am I revealing the details of this information to you? I realize it is an entirely new paradigm of thought for most of us. I certainly don't want to upset any one. But because the dolphins introduced these concepts to me in 1989, I feel it is time for the truth to be known. As the dolphins told me at the very beginning when I first met them, "This is a time of - No Secrets." 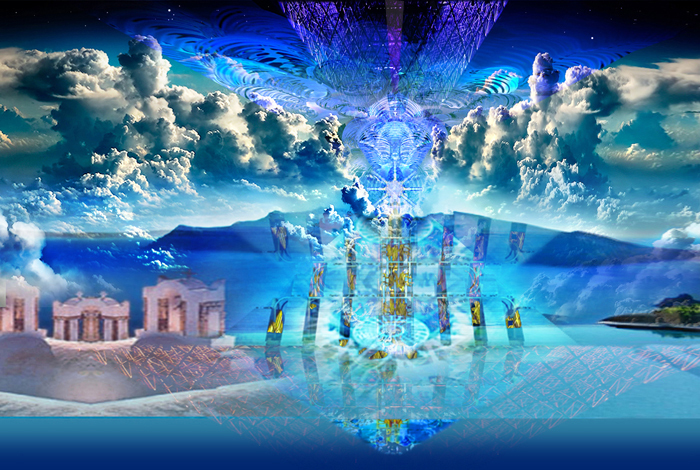 I agree that it is time for the hidden projects to be revealed and for us to understand some of the mysteries of our civilization that need to come to Light. These secret projects when brought to public awareness help us to understand what is going on in our personal lives as well; feelings of being out of balance and out of control; confusion that causes dissonance in our lives. With all things that you read and hear (including this expose), always use your own discernment regarding its truth for you. Meanwhile keep swimming among the dolphins and whales. They have not been subjected to mind altering frequencies. They can thwart the negative vibrations by emanating their own higher patterns. Always remember to follow the inclinations of your heart. This keeps you in a bubble of safety. You then reside in the vibrations of Love and Higher Light, in happiness and fulfillment. When you are there, nothing can affect you but more Love. This is how you assist the planet, its life forms and humanity. Keep shining your Light.